Home studio productions from the olden days. Except where otherwise noted, all compositions, lyrics, instruments and vocals by Panu Matilainen. Approximated oldest first order. All songs recorded and mixed on Tascam Portastudio 144, and "mastered" onto a C-cassette with a JVC boom-box back in the day. The versions here are simply digitized off the old cassette, no other processing has been done. You can actually hear the tape fading out at times. 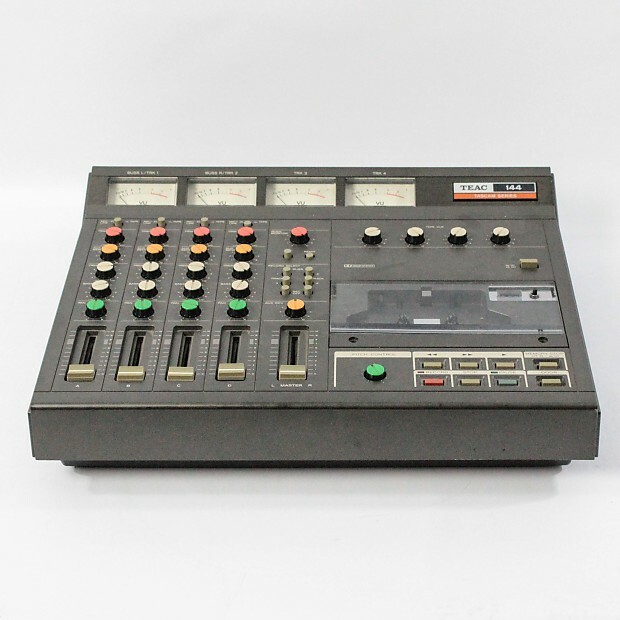 The pre-owned Tascam recorder (the unit in the picture above is not the one, unfortunately no pictures of the "studio" of my childhood bedroom exist) was co-owned with a bandmate. As for other gear, I had an acoustic guitar, an electric bass, Peavey TNT 150 bass amp, a bass fuzz-pedal, Commodore 64 8-bit home computer with a monophonic drum sequencing program and some el-cheapo no-name microphone which I think came bundled with a reel-to-reel tape recorder we had, or something. The TNT has a nine-band graphic equalizer plus additional shelving eq controls, a built-in chorus effect and an adjustable crossover function with two line-level outputs, and was my main effect device for years to come, and still have it 30 years later. This is where it all started, I was sixteen at the time. It's my first-ever home recording, of my first-ever song and lyrics, first-ever recorded vocals, first-ever guitar solo and, well, everything. And naturally you go for a six-minute progressive rock piece with bass-solos and all, and environmental-political lyrics. Of course you do. The vocals have some chorus-effect from the TNT on them to try cover up being clueless and extremely nervous about singing and barely clinging on to a tune. Both the guitar and bass solos are improvised on the spot, more or less first takes. I had no idea how to play a guitar solo but it also never occurred to me that one could compose a solo, because I never heard my bandmate do such a thing. The results are, ahem, rather peculiar. The guitar on the main solo was on loan from the same bandmate, but he needed it back before I finished the song so the distorted "guitar" in the end is actually a bass guitar. The second-ever song couldn't be much more different from the first one: a very short, melody- and story-oriented song about, hmm, ups and downs of love-life or something. For myself the most notable thing here is how much more confident the singing is compared to Planet of Fools just a few weeks earlier, there are even vocal harmonies at places. Not that it's any more in tune. This is a melancholic acoustic song about being and feeling alone. I had at least partial lyrics for it but they felt too naive even back then, so it became an instrumental. Thankfully. Even if it feels a bit prolonged this way. Lots of overdubbed guitar parts in there. On a related note, when finally recording the melody part I discovered there's a bar or two missing in each verse. Between starting all over and altering the melody I chose the latter, which is the reason for the strange jump in the melody line in the middle of each verse, eg around 0:29-0:30 time. Few teenagers like (high) school, but this is something else. I can't even begin to imagine what made me angry and frustrated enough to create such a thing. Genre-wise it falls somewhere between thrash metal and punk, so yet another entirely new style covered, and also a new highly aggressive singing style discovered. A short experimental, instrumental song featuring four bass guitars. I remember this having something to do with dreams, but it's not something that I heard in a dream and then recorded. Maybe more like trying to create a dreamlike scenario or so. A short instrumental guitar piece. I always imagined this to be an excerpt from a national anthem of an alien race, but back then I never discovered the rest of the song. A teenage fantasy about partying, co-written with a friend on a weekend evening, our real beer-drinking days still firmly in the future at that point. There's an actual polyphonic drum machine, loaned from somebody, on this track. The singing is horribly out of tune throughout but the improvised guitar solo is downright funny, in a good way. I have no idea where that came from. The background noise at the end of the solo is an excerpt from a famous Pepsi commercial of the time, sampled in all it's eight bit glory on the Commodore 64. A remake of the Alone instrumental with even more overdubs, but this time without the melody glitch. Also featuring Commodore 64 in a non-drum role for synth strings and a flute-like pad. Playing synth parts live on a qwerty-keyboard is not much fun, I remember that much. By this time I had bought a Charvette electric guitar, which I still have. On this track there's additionally a digital reverb/delay on loan from somebody, which makes the guitar solo sound nicely airy / sparkling. On the subject of the solo, by this time I had also unfortunately heard the "wisdom" about turning a mistake into jazz by repeating it. It takes more than that. A somewhat odd rock/proge/something song about longing for a girlfriend who's out of town. So it's not a rock about a shore, but rather about a rock on the shore. On this track I had the digital reverb/delay and a RAT distortion pedal on loan, making for a much nicer guitar solo sound, despite playing through a muddy bass amp. The main riff of the whole song is something a drummer friend of mine showed me one day, I just more or less accidentally turned it into a high-tempo aggressive thing that said friend was almost shocked to hear. The vocals are annoyingly out of tune at times, but other than that I'm actually quite fond of the harsh distortion, especially towards the end. Unfortunately I seem to have completely forgotten how to sing like that :( Speaking of the ending, I actually forgot to write one so it ends in a rather lame way, just dropping dead mid-flight. Another strange kind of love/longing song, the lyrics born out the void following an unusual break-up. The entire song is actually the title tune from C64 game Chain Reaction, by the legendary Rob Hubbard. I just, hmm, enhanced it a bit. The drums are doubled up with manually played "disco drums" to give it a bit more bottom end, add some guitars and vocals and voila. A non-sensical mashup of guitar lines thrown in to a loose context of a song, really just to show off. On my own scale that is. I was in a hurry to finish this before leaving for x-mas. The Tascam was starting to fall apart, most notably it had started dropping out the headphone sound randomly which is annoying at best and infuriating when you're in middle of a hot take. And then a string broke on the guitar, and I had to resort to using an acoustic guitar for the remaining parts. Which sounds just awful. So dramatizing a bit, everything fell to pieces and this turned out to be the last piece of music I wrote or recorded in over 25 years. What a sorry ending for an era I enjoyed a lot. The modern era has a page of its own.